If you have been reading my Wellness Wednesday post, you may have noticed that I have been doing healthy choices to improve my body type and health issues (aka living with Crohn's Disease and ileostopy bag on my abs) which makes shopping for clothes for me a little difficult because I want to feel and look good for me and not compared myself for an "unrealistic" body or health image! Well, I have been a "Size 14" and now I am a "Size 12" so I have been making modest budget purchases at consignment stores and places like Kohl's to replace each old size for new size pants!! 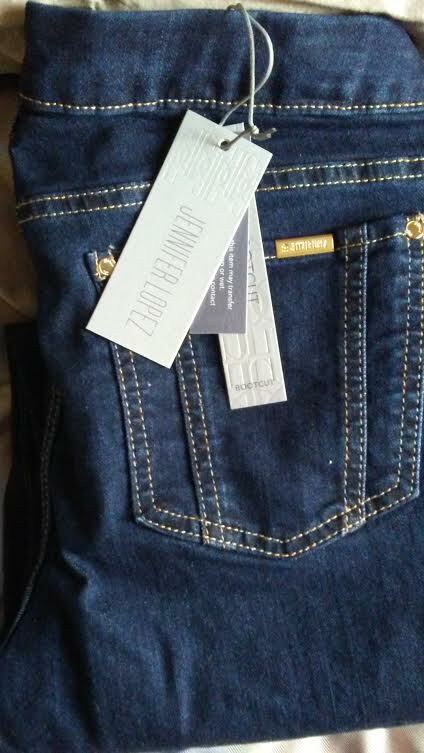 I love comfortable jeans that look and fit well on my curvy body and I found these Jennifer Lopez Boot Cut Blue Jeans at Kohl's in the Winter Clearance!! I love the design, fit and feel of this part of jeans and hope to add more to my jean/pants collection for Spring! Congratulations for doing so well on your wellness journey! I have found the best bargains at consignment stores and thrift shops. You're such a savvy shopper! Keep us posted. Congrats on the smaller size! I like Kohl's for jeans too. But I've found some affordable ones that I like at Walmart lately too.